So there is a Black Slime Biofilm taking over the Jefferson Memorial, Lincoln Memorial, Washington Memorial and The Arlington National Cemetery as CBS This Morning highlighted. The US National Parks Services is at it’s wits end on this “invasion” and do not know how to mitigate it. This is not a small thing to take lightly, BUT there IS an answer and a solution to this problem. Is it dirt, mold, good, bad? Temporary or Permanent? Where did it come from? Kinda reminds me of the 80’s movie Invasion of the Body Snatchers. Is it just native to Washington, DC or is it a common black bacteria that COVERS the WORLD? We know it is unsightly and is it causing damage, and HOW do we eradicate this stuff? I was recently in Israel and seen there, I’ve been to DC, Louisiana, Texas, Florida, North and South Carolina, Seattle,WA, and live right here in Northern California. Although, I have not personally inspected the DC Memorials myself, I have a feeling I know what this strange SLIME and Biofilm is. In my opinion, it more than likely is a cyanobacteria called Gloeocapsa Magma, a black bacteria that is anywhere and everywhere we live. We know that this bacteria, when not dried out, will facilitate MOSS and Algae build up. Once this bacteria spawns and continues to multiply, it starts to “RUN” and “Streak down” the building, causing the BLACK MARKS on the sides of the building, YOUR HOUSE and Gutters… called TIGER Stripes. This bacteria settles on your roof, sidewalks, park benches, playground equipment, lawn furniture, driveway… basically, again, everywhere… and YES, IT DOES CAUSE DAMAGE to the surface of the stone, tile, concrete finish. It literally is EATING the STONE ALIVE. Powerwashing IS NOT the ANSWER will only cause MORE DAMAGE and FEED the BIOFILM the WATER it lives in… DUH! As you can see, we can CLEARLY eradicate this BLACK BLOB and bring restore the stones natural beauty. Answer: SoftWashing – The ONLY safe and effective way to eradicate and control the present and future growth of this heinous and terrible blight on our National Monuments. We affectionately call it our “NO MOSS SOSS”! 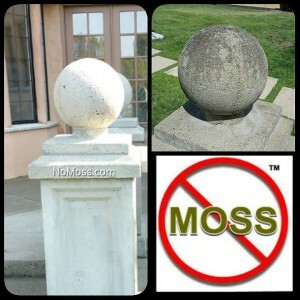 California Moss Control dba, NO MOSS is the ONLY Certified Applicator of SoftWash Systems in Northern California. WE Specialize in this and have FANTASTIC Results in the mitigation of this BLACK BLOB from your ROOF, Drive, Building, Property, Sidewalks, tennis court, playground equipment, headstones, monuments … etc. Without HIGH PRESSURE! Give us a call or check out our social media page links below for more information or contact us for a FREE ESTIMATE.